Based on body mass index (BMI), 1.5 billion people are overweight (BMI≥25.0 kg/m2) and 500 million of them are classified as obese (BMI≥30 kg/m2).2–3 Since 1980 there have been many studies on the causes and management of obesity including behavioural studies, physical activity studies, nutritional studies ranging from high-protein low-carbohydrate low-fat, high-carbohydrate low-calorie diets and drugs for the treatment of obesity, yet despite all these efforts the US population continues to increase its weight and similar situations exist in other countries, both developed and developing. In developing countries, obesity coexists with undernourished and malnourished individuals. So far, no country has been able to either prevent overweight and obesity or maintain weight loss of its population. International organisations and many scientists continue to consider obesity the result of an imbalance between energy intake and expenditure. Citing the law of thermodynamics, scientists and industries articulated the concept of ‘a calorie is a calorie’, which led to the development of a huge weight loss industry, various diets substituting ‘calories for other calories’ and books promoting ‘eat less and exercise more’. These approaches continue to be espoused today, despite the scientific evidence that ‘a calorie is not a calorie’, and that the sources of calories are important in influencing human metabolism and appetite control.4–6 For example, calories from vegetable oils high in linoleic acid (LA), an ω-6 fatty acid, are proinflammatory and thrombogenic, whereas calories from eating fish high in ω-3 fatty acids are anti-inflammatory and antithrombotic. High ω-6 fatty acid intake increases white adipose tissue that is stored and prevents its browning.7 ,8 Furthermore, calories from ω-6 fatty acid intake from vegetable oils high in LA (corn oil, sunflower, safflower, cottonseed, soya bean oil) have different effects on fat tissue development and type than calories from ω-3 fatty acid intake high in α-linolenic acid (ALA) (such as flaxseed oil, canola oil, perilla oil, chia oil). In addition, high ω-6 fatty acid intake leads to an inflammatory state, which is at the basis of obesity and other chronic diseases, whereas calories from ω-3 fatty acids have the opposite effect9 ,10 (box 1 and table 1). ω-6 and ω-3 fatty acids are essential for health and must be obtained from the diet by all mammals including human beings. Hypothetical scheme of fat, fatty acid (ω6, ω3, trans and total) intake (as per cent of calories from fat) and intake of vitamins E and C (mg/day). Data were extrapolated from cross-sectional analyses of contemporary hunter-gatherer populations and from longitudinal observations and their putative changes during the preceding 100 years. 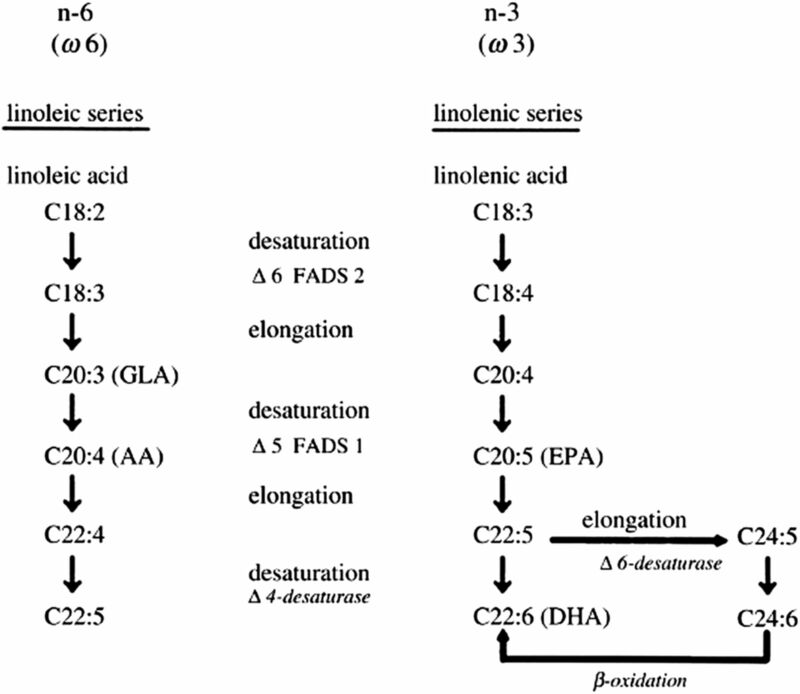 Desaturation and elongation of ω-3 and ω-6 fatty acids. The enzymes Δ6 desaturase and Δ5 desaturase are encoded by FADS2 and FADS1, respectively. AA, arachidonic acid; DHA, docosahexaenoic acid; EPA, eicosapentaenoic acid; FAD, fatty acid desaturase; GLA, γ-linoleic acid. The ω-6 and ω-3 fatty acids are metabolically and functionally distinct11 (box 1 and table 1). ω-3 fatty acids decrease adipose tissue development and lead to weight loss.17–19 A recent study based on the NIH Women's Health Initiative clearly showed the importance of the ω-6 to ω-3 ratio in weight gain over a period of 10 years in healthy young women.20 High concentrations of ω-6 in red blood cell membrane phospholipids were associated with increased risk of weight gain.20 Similarly, a high ω-6 to ω-3 ratio was also associated with increased risk of weight gain, whereas a high concentration of ω-3 in red blood cell membrane phospholipids was associated with decreased risk. This is a very important study because the investigators used red blood cell membrane phospholipids instead of dietary intake based on food frequency questionnaires that are not as accurate. Dietary frequency questionnaires suffer from two very important deficiencies in carrying out studies on the relationship of essential fatty acids (ω-6 and ω-3). One is the well-known inaccuracy based on the memory of what people ate, and the other is the variation in the endogenous production of ω-6 and ω-3 fatty acids. What is actually being circulated in the blood and in red blood cell membrane phospholipids consists of dietary intake and the endogenous production of ω-6 and ω-3 fatty acids. These two factors account for the discrepancy in epidemiologic, observational and clinical intervention studies along with other factors listed in box 2, which must be taken into consideration while carrying out clinical intervention studies. A diet high in the ω-6 to ω-3 ratio causes an increase in the endocannabinoid signalling and related mediators, which leads to an increased inflammatory state, energy homeostasis and mood.28 In animal experiments, a high ω-6 fatty acid intake leads to decreased insulin sensitivity in muscle and promotes fat accumulation in adipose tissue. Nutritional approaches with dietary ω-3 fatty acids reverse the dysregulation of this system, improve insulin sensitivity and control body fat. A high ω-6 to ω-3 ratio in current Western diets coupled with an increased synthesis of proinflammatory cytokine interleukin 6 (IL-6) from the adipose tissue of an already overweight and obese population propagates obesity by increasing or maintaining chronic inflammation. It is therefore essential to return to a balanced dietary ω-6 to ω-3 ratio based on data from evolutionary studies,11 the Fat-1 mouse model18 and the results of the NIH Women's Health Initiative clinical study.20 By decreasing ω-6 and increasing ω-3 in the diet, the proadipogenic pathway can be inhibited. The preferred ratio of ω-6 to ω-3 for optimal health is 1:2/1, which is consistent with the evolutionary aspects of diet.29 The time has come to return the ω-3 fatty acids in the food supply and decrease the ω-6 fatty acids by changing the cooking oils (figure 3) and eating less meat and more fish. 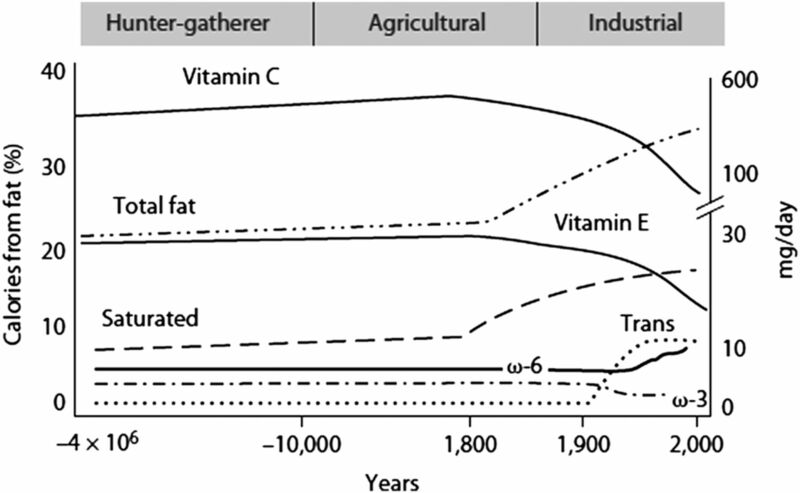 The composition of the food supply must also change to be consistent with the evolutionary aspects of diet and the genetics of the population. The scientific evidence to balance the ω-6 to ω-3 ratio is robust and necessary for normal growth and development, prevention and treatment of obesity and its comorbidities including diabetes, cardiovascular disease and cancer. This can be accomplished by studies focusing on the metabolism of nutrients, genes and their function.7 ,8 ,30–34 Genome-wide association studies (GWAS) have identified over 90 loci, and many single-nucleotide variants (SNVs) associated with BMI, with the majority of SNVs occurring in non-coding regions of the genome. Claussnitzer et al30 showed how to decipher non-coding regions and have presented a strategy to functionally analyse GWAS. Their study provided evidence that the risk allele rs 1411085 T to C SNV resulted in increased expression of IRX3 and IRX5 genes in preadipocytes, which shifted the development of these cells towards the ‘White Program’ and increased lipid storage, whereas genetic knockdown of IRX3 and IRX5 restored thermogenesis in adipocytes from persons at high risk of obesity. Thus, the risk allele functioned similarly to prostaglandin E2 and prostaglandin F2α from ω-6 fatty acids, whereas the genetic knockdown of IRX3 and IRX5 functioned similarly to ω-3 fatty acid metabolites. AA metabolites prostacyclin and prostaglandin E2 increase white adipose tissue and decrease its browning. Human studies have shown a direct relationship between plasma AA levels and infant body weight, as well as between AA levels in adipose tissue lipids and BMI in children in Cyprus and Crete.35 ,36 AA directly inhibits uncoupling protein-1 (UCP1) gene expression. Considering the high ω-6 to ω-3 fatty acid ratio of Western diets and the role of AA in adipose cell differentiation, proliferation and decreasing browning of white adipose tissue, further research should include studies on the effects of ω-3 fatty acids in blocking the effects of the risk allele (rs 1411085). Clinical intervention studies must take into consideration the background diet, the genetics of the population and be free of confounding factors listed in box 2. It is the responsibility of the governments and international organisations to establish nutrition policies based on science and not continue along the same path of focusing exclusively on calories and energy expenditure, which have failed miserably over the past 30 years.
. Omega-3 fatty acids in health and disease and in growth and development. Am J Clin Nutr 1991;54:438–63.
. Essential fatty acids in health and chronic disease. Am J Clin Nutr 1999;70(Suppl 3):560S–9S.
. The therapeutic potential of brown adipocytes in humans. Front Endocrinol (Lausanne) 2015;6:156.
. Evolutionary aspects of diet and essential fatty acids. In: Hamazaki T, Okuyama H. eds. Fatty acids and lipids—new findings. 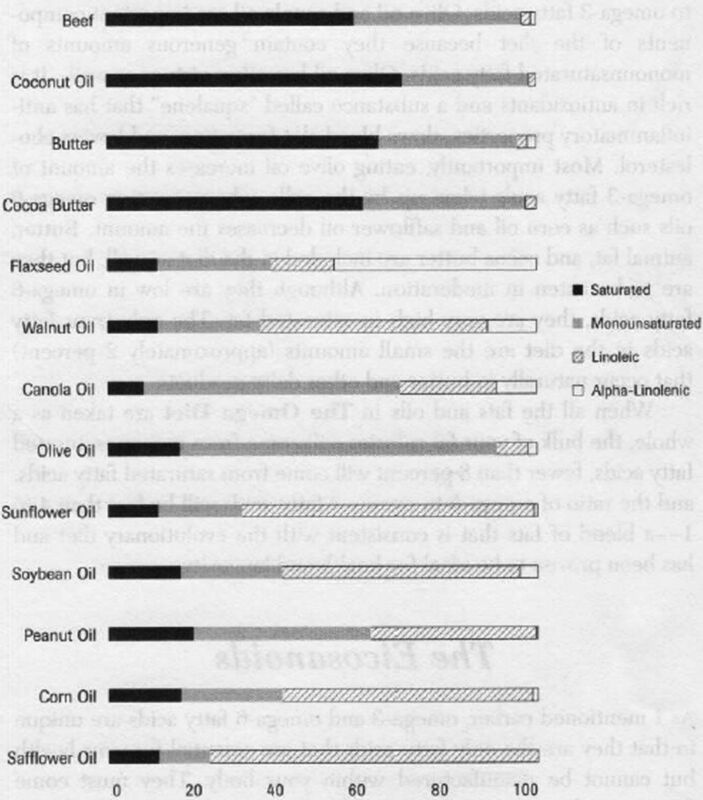 World Rev Nutr Diet, 2001;88:18–27.
. The omega diet. Harper Collins, 1999.
. Polyunsaturated fatty acids in the food chain in Europe. Am J Clin Nutr 2000;71:176S–8S.
. Polyunsaturated fatty acids in the food chain in Japan. Am J Clin Nutr 2000;71:189S–96S.
. Effects of an Indo-Mediterranean diet on the omega-6/ omega-3 ratio in patients at high risk of coronary artery disease: the Indian paradox. World Rev Nutr Diet. Basel, Karger 2003;92:74–80. Contributors APS conceived and outlined the paper, JJD provided additional input and references and both authors finalised the paper.